About as Close to the Beach as You Can Be North of Scenic Highway 30 A ! Unlimited long distance phone calls in the US and Canada. Flat screen TV with NETFLIX access in the living room. Flat screen TV with built-in DVD player in Master and Guest Bedrooms. Private fast and reliable WIFI cable internet access. Just a short walk to the beach with access by way of three private paths just across the street. TOCCA Balsamo shampoo, conditioner, and bath gel provided. Escape the high-rise crowds, strip malls, and bumper-to-bumper traffic and enjoy quiet and spacious accommodations at the Gulf Place Caribbean Condominium. Still, within a short drive you will find the sights and attractions of Seaside, Destin, and Pensacola, with airport access at either Fort Walton Beach or Panama City. 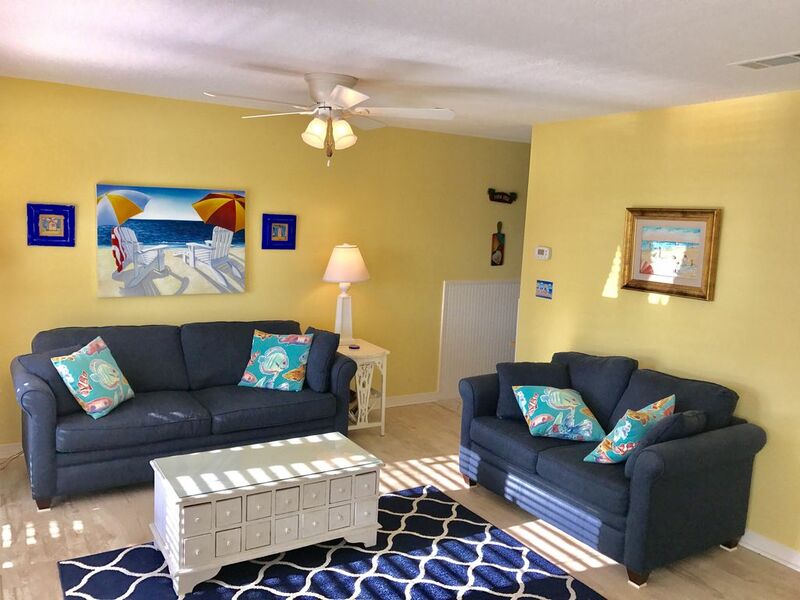 We invite you to stay in our comfortably decorated condominium on scenic highway 30-A, along the sugar-sand beach and emerald waters of South Walton County, and in the vibrant community of Gulf Place in Santa Rosa Beach, Florida. Gulf Place is just across the street from the beach, with private access for Gulf Place guests. The unit is on the third of four floors (elevator access) in this popular community, right at the top level of beautiful palm trees which enhance your gulf view. A spacious balcony is accessed by two sets of French doors, and provides ample seating. Accommodations include one king, two twin beds, and two bunk beds, with one master bathroom and another bathroom accessed from both the hallway and the guest bedroom. Six people can be quite comfortably accommodated. Television with cable is available in the living room and in both bedrooms. The unit has been decorated in tropical and nautical fabrics, and you will enjoy artwork which has been collected on our travels around the world. Our guests have access to three pools (one heated), tennis courts, shuffleboard, walking/bike trails, and charcoal grills. For golf enthusiasts, the Santa Rosa Beach and Golf Club is only a short walk away, and offers 18 holes, some with gulf view! You can also enjoy summer concerts on the grassy amphitheatre in the center of Gulf Place. For cooking, the kitchen is fully furnished, and the adjacent dining table comfortably seats six, with room for two more on stools at the bar. Two grocery stores and a wonderful family-owned and operated seafood market are only a short drive away. And for those who need computer access, free Wi-Fi is available. Every vacation should include opportunities for shopping and dining, and at Gulf Place you will find both. Right in our community you can enjoy an old-fashioned ice cream parlor, pizzeria, wine bar, and a full-service restaurant, with other dining opportunities within several blocks. Shopping in Gulf Place includes clothing boutiques, bike rentals, day spa, hair salon, and a full-service pharmacy. Only several miles away you can also enjoy the Silver Sands Outlet Mall, with dozens of upscale stores, including Polo, Brooks Brothers, Cole-Haan, Coach, and many more. For years we rented at various places along Scenic 30A. We decided to buy our unit at Gulf Place Carribean because it is on the third floor, has a good view of the gulf, and is as close as we could get to the beach from a property located on the north side of 30A. In front of the building are elegant single family homes. So, whenever we went to the beach we found a quiet place away from others. The sunsets from either the beach or balcony are beautiful. The sand is white. The sea is emerald. There are more than three private access points to the beach, just a short walk away. Within Gulf Place there are a number of restaurants and shops, all within walking distance. A gas and convenience store just down the street. Plenty of convenient parking at the building. TOCCA Balsamo shampoo, conditioner, and bath gel. Just a short walk across the street to three private access paths to the gulf coast beach. Located in center of building and just feet away to a designated unloading parking zone. Open layout with views of the living room TV and the Gulf through two sets of French doors. Large flat screen in the Living Area. (3) Each bedroom has a flat screen wall mounted TV with cable service. Roomy balcony with comfortable wicker seats. Lovely views of the ocean, a pond, and the swimming pool. Available to rent from business located on property. Public course located just a few miles away. Our building has a heated pool during the winter months. Usually a quiet pool for adults. Great place to entertain. Two sets of large French doors provide access to the balcony with fine furniture and spacious seating. Elevator access from convenient ground floor parking lot. Very nice and convenient for our needs. Owner was kind and responsive to my questions. Thank you for sharing your home with our family! Very nice condo, excellent location. The condo was clean, comfortable, and attractively decorated. The owner was very responsive and helpful. Bright, comfy place for beach getaway! This place had everything our family looks for in a beach getaway plus some extras. It is an easy walk to the beach with gear in tow. It is decorated nicely with interesting and colorful art. It has a super close pool option when kids tire of the sand. We enjoyed the proximity to the restaurants and fun shops. My personal fave — the bike and running path on 30A is right there. As stated in many reviews, Kirk is very attentive to any question or need. The place was fully equipped with all the essentials. Definitely recommend. Fantastic owner and very clean! I was very impressed with how attentive the owner was to our needs while we stayed at this unit. The unit was very clean and well equipped. I would absolutely stay here again! My family has stayed here 3 times in the past 5 years and will stay here again. It is a comfortable place to stay with many amenities and great dining near by. All rates are subject to change prior to reservation confirmation.